Recent photographs from the excavation can be seen below, courtesy of Cotswold Archaeology. When did the By-Pass open? The by-pass opened in December 2015. Why was the By-Pass built at Cannington? The bypass was built at Cannington to take traffic to the new proposed power station, Hinkley C.
Where is the Cannington By-Pass? The by-pass starts to the south west of Cannington village from a current roundabout on the A39 and runs to the west of Cannington, crossing the entrance to Brymore School as well as Withiel Drive, Sandy Lane and Chad’s Hill, before joining up with the Rodway to the north of Cannington. Has any previous archaeological work been done here? Yes. An archaeological evaluation was undertaken by Cotswold Archaeology from November 2010 to January 2011 on land north-west of Cannington. Forty nine trenches were excavated along the line of the proposed by-pass. The evaluation showed archaeology dating from the early Bronze Age to the modern period. Of particular interest was the centre of the route, which showed a series of potential quarry pits and a wall, both of which contained pottery from the late Iron Age to the Roman period and three other walls very close to each other. More information about the history of the village can be found here. Who carried out the 2014 excavations? Cotswold Archaeology excavated this site. 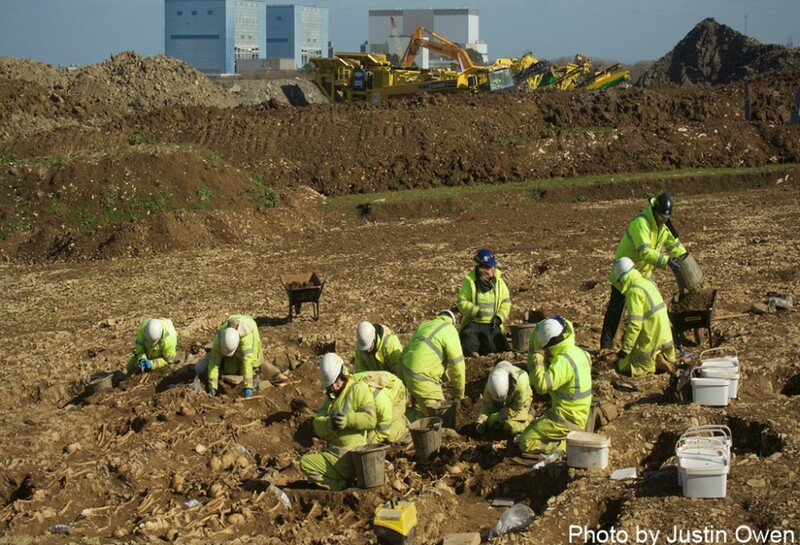 They also carried out the excavations on the main site at Hinkley Point. Where did the archaeologists dig in 2014? The archaeologists excavated in the centre area of the proposed by-pass, just north of Sandy Lane, Cannington. This was the site of most interest investigated during the 2010-2011 evaluation. Geophysical surveys showed areas of anomaly, for example showing possible banks or earthworks made by people in the past. View across 2014 excavation. Cannington quarry in background. What did the archaeologists find during the 2014 excavations? The archaeologists found evidence of people living or working here from the late Bronze Age to modern times. Of particular interest were the remains of three Roman buildings. These had the foundations of stone walls, although later quarrying had cut into many of the features. One building had a hypocaust which was an underfloor central heating system. Hot air from a furnace was carried through box flue tiles and then circulated under the floor surface supported by columns of tiles. It has been interpreted as a bath house. Another building which was three sided was probably a barn. A long corridored building with rooms on each side was the main villa building. Re-cut ditch containing Roman pottery and tile. Discovery of foundations, Roman building 1. A large quarry pit probably dates from the 19th century. Did the archaeologists discover any finds? Yes. Archaeological finds included Iron Age and Roman pottery sherds. The Iron Age pottery included decorated Glastonbury ware. The Roman pottery included Samian ware imported from Gaul (France) and grey wares. There were also Roman roof and floor tiles, coins, a brooch and a hairpin. Once the careful work of cleaning, identifying and interpreting the finds and other evidence is complete, a report will be produced and the finds and archives deposited with the South West Heritage Trust in Taunton. Some of the stonework from the villa has been used to recreate a Roman dining room at the Avalon Marshes Centre at Shapwick, near Glastonbury. Building material from Cannington Roman villa which will be used for building the replica dining room at the Avalon Marshes Centre.